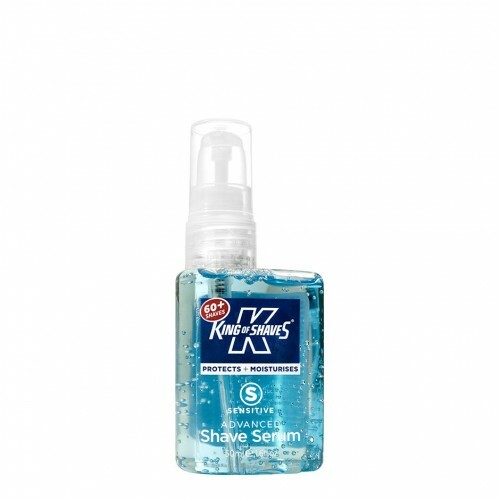 Amazing razor glide and shaving performance from this concentrated Shave Serum that gives up to 60 shaves from just one compact bottle. Leaves skin smooth and supple with no irritation or razor rash. A better serum for a better shave! 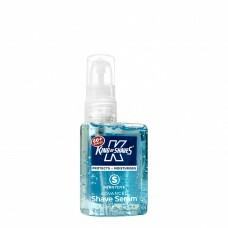 King of Shaves Advanced Shave Serum Sensitive is formulated to give you around 60 superbly close and comfortable shaves. Our Shave Serum is a hybrid product that takes the best things from a shave gel and the best things from a shave oil, so you end up with a concentrated shave gel that has the amazing glide and slip characteristics of a shave oil. It delivers enhanced razor glide and excellent blade performance leaving your skin incredibly smooth, supple and hydrated, not dry and tight. Low foam formula so you can see where you’re shaving; perfect for shaping facial hair. Perfect for holidays, weekends away, gym bag and as a replacement for your regular foam / gel. Up to 60+ shaves from one bottle! 50ml. PETG Bottle. PP / Stainless Steel Pump. PP Cap. Made in the United Kingdom. King of Shaves products are tested on humans, not animals. Colour and design of actual packaging may vary slightly from those shown. Hydrogenated polyisobutene, Isopropyl myristate, Helianthus annuus (Sunflower) seed oil, Butylene / ethylene / styrene copolymer, Ethylene / propylene / styrene copolymer, Laureth-4, Eucalyptus globulus leaf oil, Glycerin, Mentha viridis (Spearmint) leaf oil, Mentha piperita (Peppermint) oil, Tocopheryl acetate, BHT, Cinnamomum camphora (Camphor) bark oil, Vitis vinifera (Grape) seed oil, Lecithin, Limonene, CI 61565 (Green 6), CI 60725 (Violet 2). PREPARE:Shave during / after warm bath or shower. Cleanse face first with quality face wash or gentle exfoliating scrub. 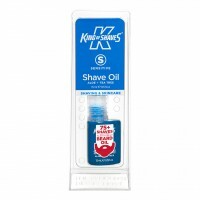 SHAVE:Dispense 2-3 pumps of Shave Serum onto hand and massage into wet beard. Using a sharp blade, shave carefully in the direction of hair growth taking care around the sensitive neck area. Rinse blade frequently.